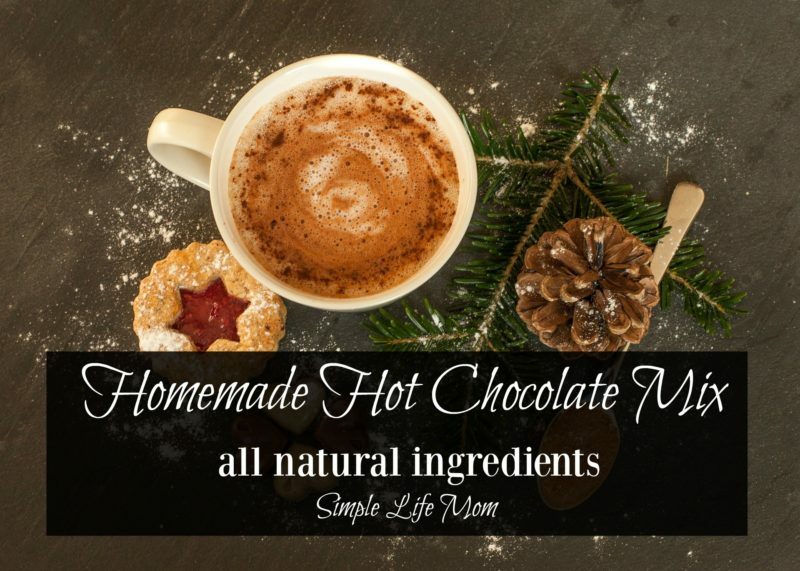 Hot chocolate is a delicious treat for cold children coming in from playing in the snow. I like having something on hand that has the type of ingredients that I can be happy about. Yes, there is sugar of course, but I want to be able to give my children something that does not have preservatives, artificial flavoring, and other ingredients that I disagree with giving to my children. 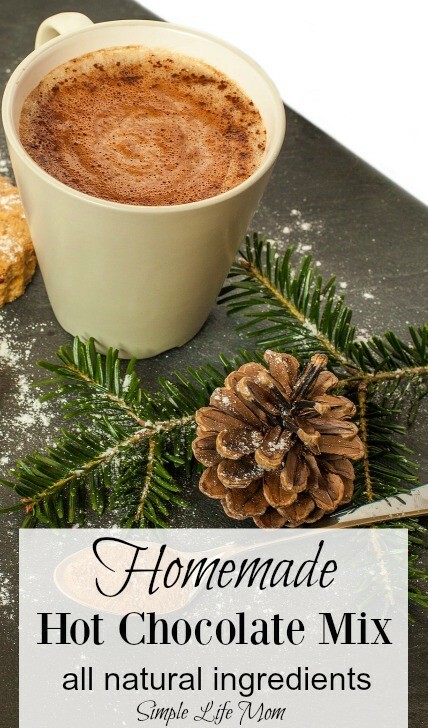 This mix is great, because I can grab this homemade hot chocolate mix right out of my cupboard and not have to start from scratch. I can make a large batch and it will last all winter. This makes a great gift as well. There are not a lot of ingredient to this recipe, but the more that’s done ahead of time, the better in my house. There’s always bread to make, meals to cook, children to teach. So not spending money on cocoa mix that has all kinds of ingredients I don’t want in it, and not spending time making my own every time is a great bonus. You can add more or less sugar depending on taste. I tend to add less if I am incorporating chocolate chips into the mix. Plus, this can be given away as a gift. Just place each ingredient in layers within a small tin, jar, or bag (or mix them and scoop them into the tin, jar, or bag) and don’t forget the marshmallows. Decorate with a ribbon. It goes well with a gift of Homemade Vanilla Extract. In a large jar, add cocoa, sugar, and powdered milk. In a blender, chop chocolate chips (say that 3 times fast) into tiny bits. Add vanilla, close jar tight, and shake. Add 4 Tablespoons to mug. Add hot water. Add 4 Tablespoons to blender. Add hot water (enough for 1 mug) and blend. Cocoa will be frothy and super yummy. Thanks girl, my sis is going to love this recipe!! !